American Wigeons at Huntington Central Park having a whistling contest. Eurasian Wigeon at Huntington Central Park. 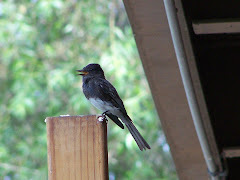 This is a rare bird, but is regulary seen around Orange County in the fall and winter. Male Mandarin Duck (Exotic--non-native Asian species--most are escapees) at San Joaquin Wildlife Sanctuary. Seen from time to time in Orange County, CA. Male Ruddy Duck in almost full breeding plumage. Just a little black still on the tip of the otherwise bright, blue bill. Female Ruddy Duck at at Mason Regional Park swimming with her tail down. White-winged Scoter--female looks like the Surf Scoter female with less clearly defined white patches. 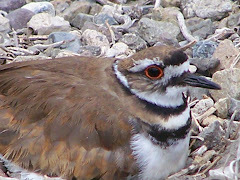 This is a rare bird for Orange County. 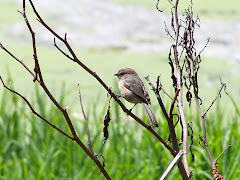 Photo taken at Bolsa Chica Ecological Reserve . 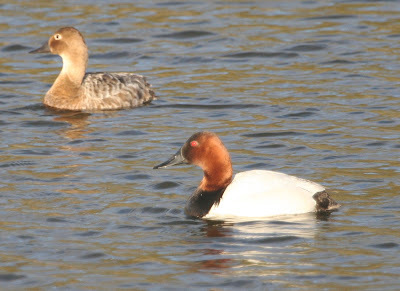 Canvasback Ducks Photo Courtesy of US Fish and Wildlife Service. Photographer Donna Dewhurst. Male Ring-necked Duck Photo Courtesy of US Fish and Wildlife Service. Photographer--Lee Karney. 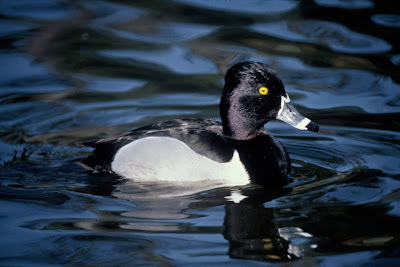 Ring-necked Duck Courtesy of US Fish and Wildlife Service. Photographer Dave Menke. Here is a male Hooded Merganser courtesy of US Fish and Wildlife Service photographer Tim McCabe. 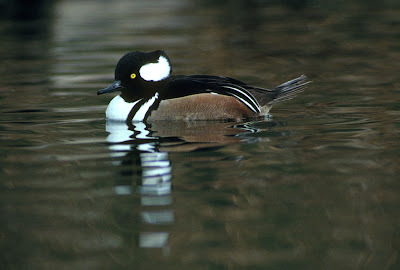 The Hooded Merganser is a rare bird for this area but turns up regularly in our rivers, lakes, estuaries, and ponds. Places like Bolsa Chica Ecological Reserve, and Upper Newport Bay Ecological Reserve aka Newport Back Bay, San Joaquin Wildlife Sanctuary, and several of the Regional Parks. Here is a female Hooded Merganser courtesy of US Fish and Wildlife Service photographer Glen Smart. 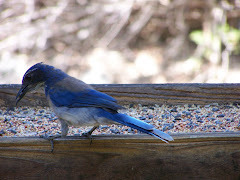 Again, a rare bird that turns up on a regular basis. So when you are out birding in fall, winter, and early spring keep your binoculars and camera ready to spot some great wild ducks in Orange County! 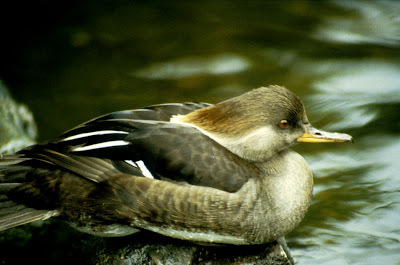 Check out the links below for more on ducks and places to go bird watching to see ducks. 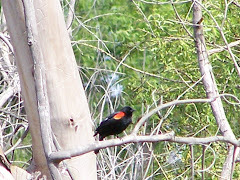 We have lots of birding hot spots in Orange County where you can see wild ducks. Strange-looking ducks and duck-like birds you might see in Orange County. 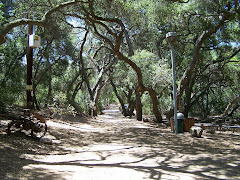 Orange County, California has many great birding places including wonderful parks, nature centers, wildlife refuges, wilderness areas, and a national forest. Great place to see wild ducks or do any kind of birding. You can see more of the wilder variety here like Northern Pintails, Buffleheads, Scaups, Mergansers, and Scoters as well as Ruddy Ducks, American Wigeons, and Northern Shovelers. Another birding hot spot. 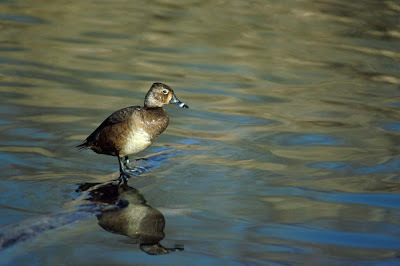 Ruddy Ducks, American Wigeons, Mallards, and Northern Shovelers. Lots of surprises here as far as birding. You never know what you might find. Mostly Ruddy Ducks, American Wigeons, and Mallards though. Wilder fresh water ducks and the more common ones, too. Ruddy Ducks, American Wigeons, Pintails, Buffleheads, and Northern Shovelers. Mostly the usual park fair with a few occasional surprises.